Precinct 4 Commissioner Joseph Palacios is seen during the Hidalgo County Commissioners Court meeting Tuesday, Jan. 9, 2018, in Edinburg. SAN CARLOS — Hidalgo County commissioners moved forward with the construction of an emergency services facility here Tuesday — just 10 days after a mobile-home fire claimed the lives of a mother and her two young sons. San Carlos, a rural community that sits east of Edinburg and North of Donna, is in dire need of a hub for emergency services, Hidalgo County Precinct 4 Commissioner Joseph Palacios said. He estimated there are about 6,000 people living within the unincorporated area that don’t have immediate access to those types of services. Edinburg currently provides fire protection for the area, which is located about five miles outside the city’s jurisdiction, Edinburg Fire Chief Shawn Snider said. County officials estimated Tuesday it takes between 10 to 25 minutes for first responders — who are stationed miles away — to respond to emergencies there. Last month it took Edinburg firefighters six minutes to arrive at the scene of a blaze near the intersection of Petirrojo Street and Sharp Road. And even though the response time was shorter than the 10- to 25-minute range the county estimated, there was still loss of life. When firefighters arrived at the trailer home, “half of it was collapsed and half of it was still standing, but all of it had fire coming out of it,” Snider said. Lucy Flores, 31, and her two young sons, 7-year-old Ricardo Gomez and 3-year-old Danny Gomez, died as a result. The cause of the fire remains under investigation by the Hidalgo County Fire Marshal’s Office. While plans for the San Carlos facility were already being discussed, the deaths further expedited the proposed project, Palacios said. “The recent incident and loss of life prompted us to utilize current resources and begin development to a second facility in our more populous rural community of San Carlos and La Blanca,” he said. Palacios, whose precinct includes both communities, said the new building will be modeled after a similar project in the Linn-San Manuel area, another rural community within his precinct. When the Linn-San Manuel Fire Station went down in flames in late 2011, the county partnered with Emergency Services District No. 3 to construct a new facility for the community. That building now provides a home for fire protection and law enforcement officials who serve the community. “We’re mirroring the same facility that we built in Linn-San Manuel, and were working with the same ESD that built this facility,” Palacios said. There is an ESD in each county precinct, charged with providing emergency services for people living in rural areas. ESDs, however, are not funded by property taxes, but instead through 9-1-1 fees. “When you get a phone bill, there’s a fee assessed for 9-1-1 services,” Palacios said. Both entities are still trying to iron out the details for the project, which is estimated to cost about $1 million. 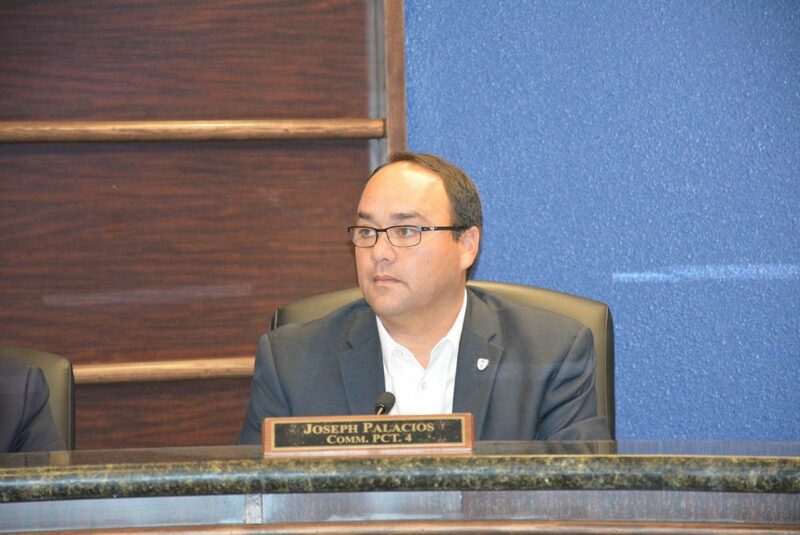 Palacios said his office re-allocated funds from the capital improvement fund in order to make the building a reality. The county’s exact contribution has yet to be determined as both entities continue to iron out the details. On Tuesday, commissioners selected the architectural, surveying, and engineering firms for the facility. The Warren Group Architects Inc., R.O.W. Surveying Services and Millennium Engineers Group Inc. were chosen to carry out the project. The county already owns the land where the facility will be located, Palacios said. It sits near the new San Carlos Community Resource Center near Sunflower Road and State Highway 107. The county commissioner hopes construction can begin sometime this summer, with a completion goal set for summer 2019.